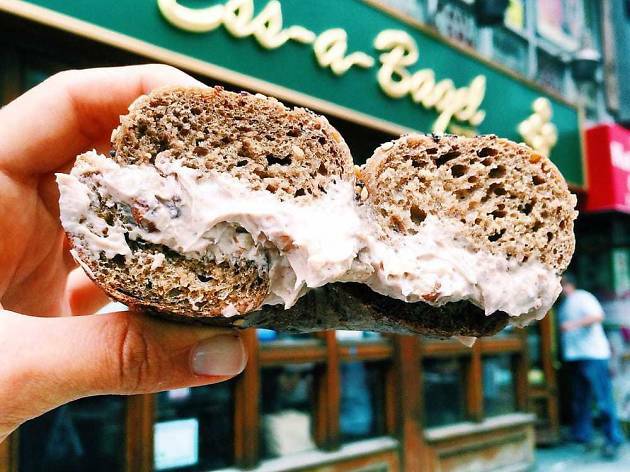 Photograph: Courtesy Yelp / Karen C.
Photograph: Courtesy Yelp / Megan P.
Photograph: Courtesy Yelp / Albert K.
Large, crusty bagels with pillowy insides are hallmarks—along with notoriously long lines—at this beloved shop, which launched in 1976 on 21st Street before expanding to Midtown East. 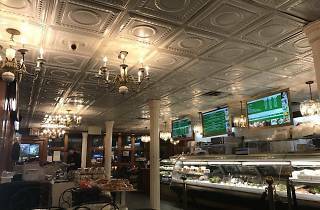 Expect 18 varieties of house-made cream cheese, from sweet (blueberry, banana nut, Oreo) to savory (sundried tomato, cheddar, jalapeño), and an entire lunch docket of bagel sandwiches (turkey club, pizza bagel). 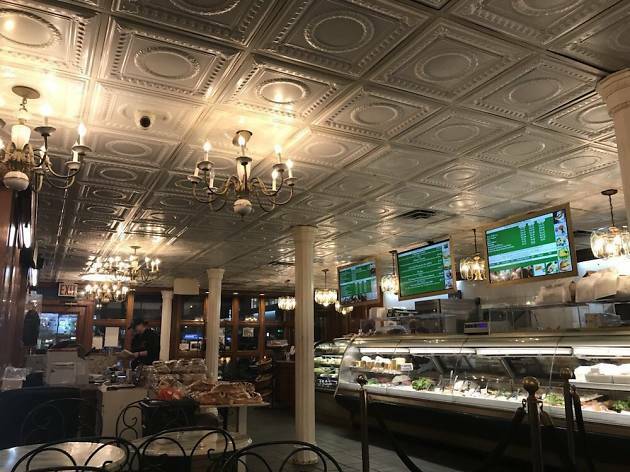 My favorite bagel in the city- I used to live across the street from the old downtown location, and will go out of my way to get a bagel from Ess A- Great selection of cream cheeses/other toppings- They go heavy on the cream cheese. Always a good day when I've timed it right that I've arrived when the everything bagels are fresh out of the oven- SO GOOD! I tend to ask for the cream cheese on the side when this happens to avoid a melted mess. I. Love. Bagels. With. Lox. And. Chive cream cheese. Capers. Red onions. Sliced tomato. Guess what place has all of this, in one perfectly put together package called the 'Signature'? THIS JOINT RIGHT HERE. Guess who gets it EVERY time I'm in town for work? THIS GIRL RIGHT HERE. The bagels are SO fresh, the cream cheese isnt skimped on (and for those that care they have like 10 flavored tofu creams too which I've never heard of and personally don't want but if its your thing, this place has got it), the smoked salmon is plentiful and there are so many options if you want to build your own, just don't take too long because the line is long and the process is legit. They also had red velvet croissants last time I was there - didn't have one, but hot damn! I will next time. As Julie mentioned, Ess-a-Bagel is one of the few "best rated" bagel places that truly does hold up to its name. Ess-a-Bagels are big, soft yet crunchy, and always satisfying. They have a wide variety of spreads and bagels to choose from and the line does move fast. However, if you are in a hurry I have used their pick-up ordering through Yelp and while it is a long wait, it is totally worth it to skip past everyone! Love love love this place!! 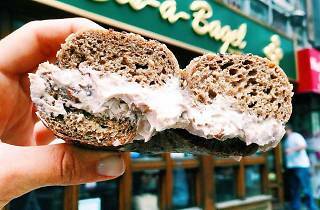 There are many places in New York City that claim they make the best bagels. Well it’s quite possible that Ess-a-Bagel wears the bagel crown in this great city of ours. Only New Yorkers know what takes a bagel to great status and they know how to spot one. Don’t be deterred by the usual line of tourists waiting in a long line outside to get into Ess-a-bagel, the staff keep everyone moving along quickly. 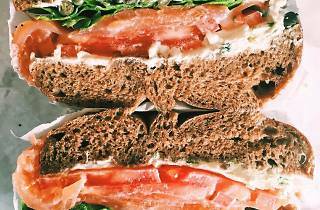 Bagel choices are endless as well as about twenty varieties of cream cheese. You can also have a delicious veggie or turkey burger in between the bagel deliciousness. 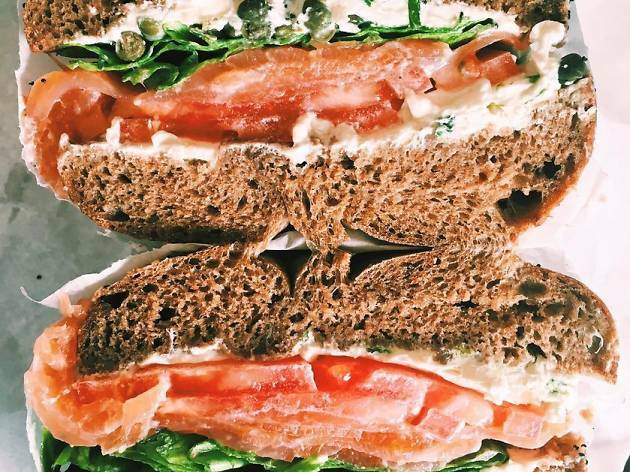 It's worth waiting in line for a bagel from Ess-a-Bagel. The people behind the counter keep the line moving pretty fast, so make sure you know your order before you get to the front. If you hesitate, you might get an earful—but that's part of the charm. I'm in love with their pumpernickel bagels. Disclaimer: I'm British so our bagel standards are far lower than US standards but for my money (which is rapidly declining in value thanks to Brexit) the bagels here are a steal for a filling and tasty eat in this area of Manhattan! There's a dizzying array of choice of bagels, fillings and cream cheeses (or tofu cheese for the vegans/health conscious). If you find the sheer range of choice paralysing, my tip would be the everything bagel with lox, capers and scallion cream cheese - it merits the thumbs up emoji multiple times over!